This week’s feedback came from an Australian supporter who contacted CMI’s Head of Ministry Gary Bates. 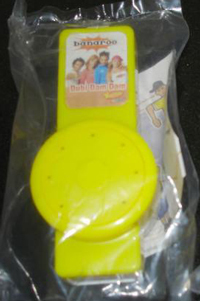 A McDonald’s™ Happy Meal™ musical toy featuring Dubi Dam Dam by German band, Banaroo. I thought you might find this interesting. Recently I took my children to McDonalds for a treat and they received a little music toy with their meal that plays an innocent sounding chorus of a tune called Dubi Dam Dam (By a German pop group called Banaroo). Dubi Dam Dam - Da Dubi Daba Dibi Dam … etc. Dubi Dam Dam - Da Dubi Dibi Dam … ’ etc. (finish). I wonder whether abduction claims in Europe will go up as a result of this song? I went online and actually watched the video clip that accompanied the video. It features friendly one-eyed green alien creatures singing along to the tune! 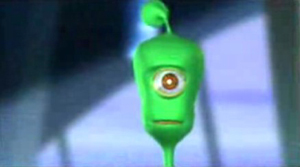 One of the stars of the Dubi Dam Dam video clip, a green alien. It seems amazing that a major multinational corporation sees no problem in promoting such ideas to very young children. But we shouldn’t be surprised. As we’ve demonstrated time and again, beliefs in aliens and UFOs have become mainstream. Despite no physical proof of intelligent extraterrestrials the idea that ‘there must be something else out there’ is a virtual fact for most. A rapid change in our cultural thinking on this subject has occurred over the last couple of decades. My book Alien Intrusion: UFOs and the Evolution Connection highlighted that results from a Gallup Poll in 1947 suggested most people thought UFOs were hoaxes, secret weapons, or phenomena that could not be explained. However, by 1996 results from another Gallup Poll showed that 70% of people believed that the US government was involved in conspiracies because it knew more about UFOs than it was letting on. A more recent Readers Digest poll was discussed in an article called The war of the worlds comes down to Earth, and incredibly, it stated that 6 out of 10 people already believe that aliens are monitoring human activity. It is no longer relegated to just a few ‘true believers’. [A] youth pastor … asked …, ‘Who believes in UFOs, aliens and extraterrestrial life?’ …. [E]very single person in the church youth group said ‘Yes’. In short, most people would find a fun video clip and catchy tune as harmless and think my following comments to be over the top. For the majority there will be no sinister effects resulting. But in the big picture, popular culture like movies, music and the media in general, are potentially desensitizing generations of young minds with the idea that ‘aliens are with us’. Science fiction, which contains mainly alien themes, is the most popular entertainment genre today (see Evolution and the science of fiction). A couple of years ago when speaking at a Bible College on this subject, a youth pastor told me he surveyed the young folk in his youth group and asked them the question, ‘Who believes in UFOs, aliens and extraterrestrial life?’ Even I was surprised when he said that every single person in the church youth group said ‘Yes’. Spiritual deception in the form of unexplained UFOs and associated alien phenomena is on the increase, I believe, due to this desensitizing. Personally, I have used science fiction as a teaching tool with my own children. When a movie shows those weird and wonderful aliens on other planets, I have explained that the underlying premise or implication is that they evolved there independently of the earth. And that’s the bottom line. Most believe that life evolved ‘out there’ in the same way that life evolved on the earth (read ET needed evolution). We are all too aware of how beliefs in evolution can lead ultimately to the slippery slope of unbelief. As Christians we need to be equipped, and particularly teach our young ones the implications of believing in extraterrestrial life. In my opinion, such a view destroys the very Gospel of Christ. 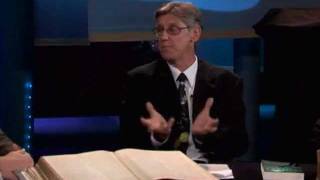 For a comprehensive discussion on this subject read Did God create life on other planets?